The club was formed in 1946 although a previous club existed in the town from 1880 until 1931 before disbanding due to their landlords, the cricket club, increasing the rent. The new club started out in various local leagues including the London, the Delphenian and the Athenian. 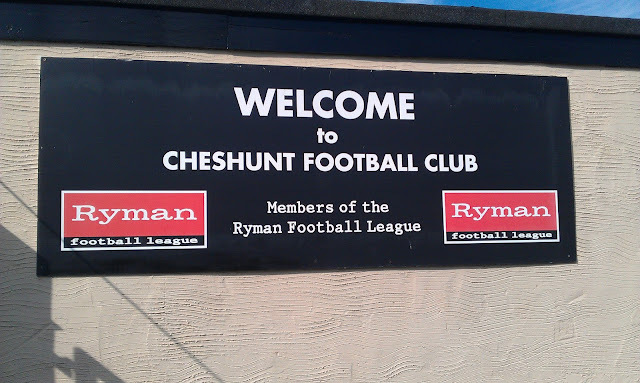 The latter was eventually dissolved into the Isthmian League and that is where Cheshunt have spent the vast majority of their time since. They reached as high as step 3 between 2004 and 2008 with two 16th placed finishes during a three-year stint in the Southern Premier. Since their relegation, they have played in the Isthmian D1 North with the closest they have come to returning being in 2016 when they finished 6th, just outside the playoffs. 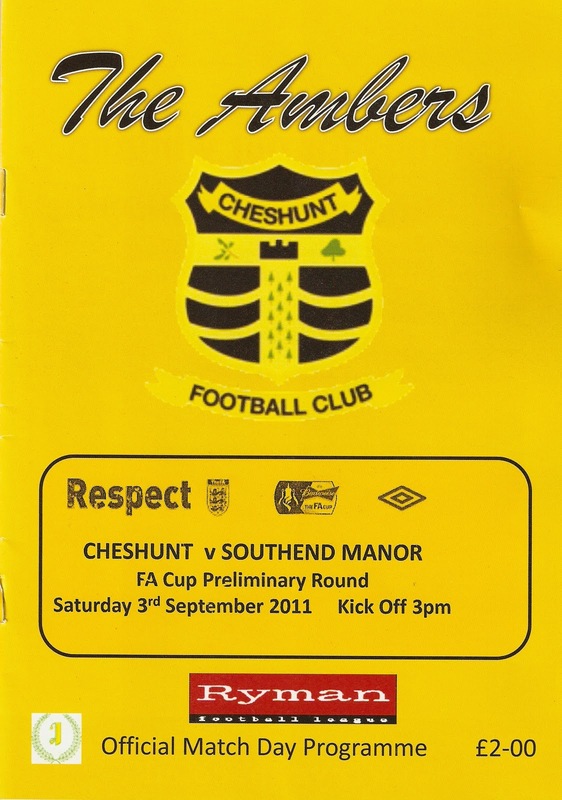 In the FA Cup, Cheshunt have reached the 4th Qualifying Round in 1958 (a 6-0 defeat to Kings Lynn), 1966 (an 8-0 defeat at Wycombe Wanderers), 1970 (a 5-2 defeat at Bishops Stortford) and 1978 (a 4-1 defeat at Leatherhead). 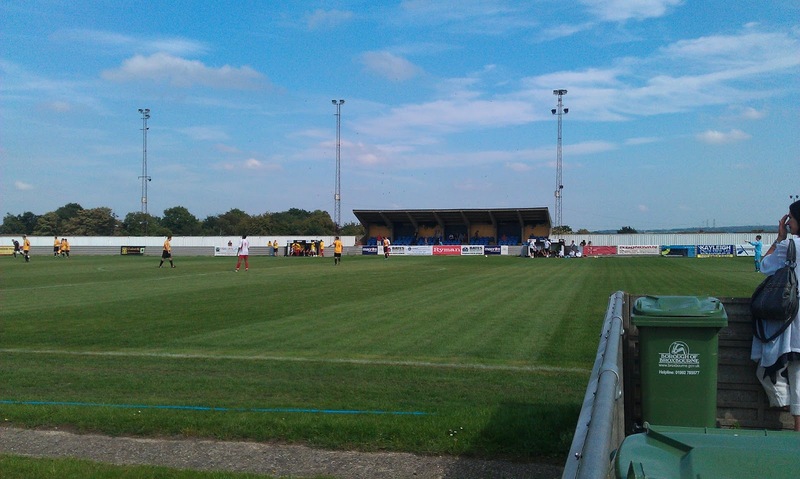 The club also got as far as the 3rd Round of the FA Trophy during 2004/05 where they lost 3-0 in a replay to Leyton. In the 1981/82 season, Cheshunt got to the FA Vase Quarter Final - beating Kingsbury Town, Tiptree United, Windsor & Eton & Hemel Hempstead before losing to Blue Star.Local honours include the London Charity Cup, the East Anglian Cup, the Herts Charity Cup and the Herts Charity Shield. The club once received £10,000 from Peterborough United for striker Lloyd Opara, the striker famously featuring in a Sky One documentary called 'Big Ron Manager' where manager Steve Bleasdale signed him instead of Stefan Moore, much to Ron Atkinson's frustration. The town of Cheshunt itself has supermarket giant Tesco based in its town. 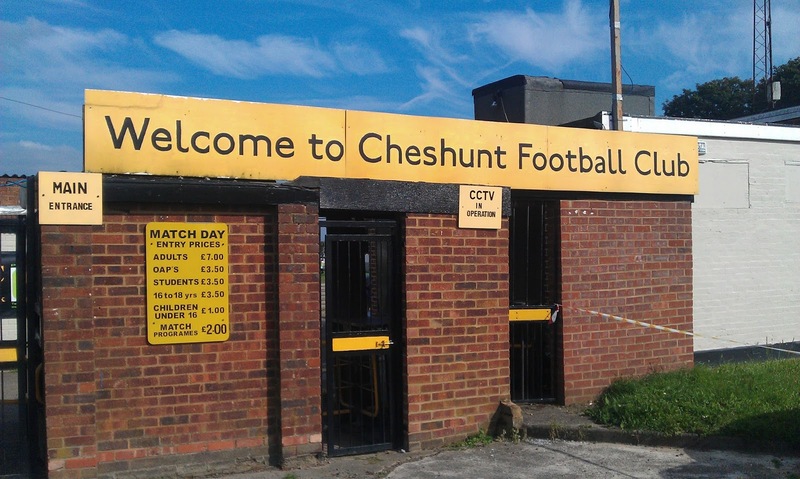 Famous people to have been born in or attended school in Cheshunt including Cliff Richard, Victoria Beckham, David Bentley and Linda Lusardi. After the Bishops Stortford v Boston United game earlier that day, I faced a quick dash across the M25. Luckily it was running OK for once and I made it to the ground before kick off. After paying £7 entry and £2 for a disappointing programme I went in the ground hoping for a better game than the dull 1-0 away win I had witnessed earlier that day. It started off well enough - the chips from the tea bar were nice and freshly cooked. But that was where the joy ended. It was a dismal game, barely any decent play of note and several people left well before the end. To add insult to injury, the other game I was considering - Waltham Abbey v Ware had 8 goals in it, finishing 7-1 to the home side. 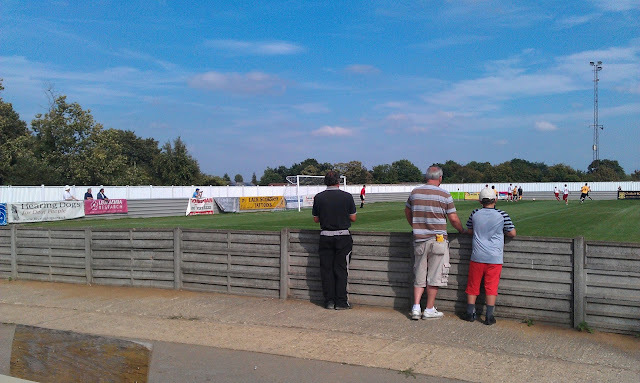 I obviously picked the wrong games that day - neither was a good advert for non-league day. 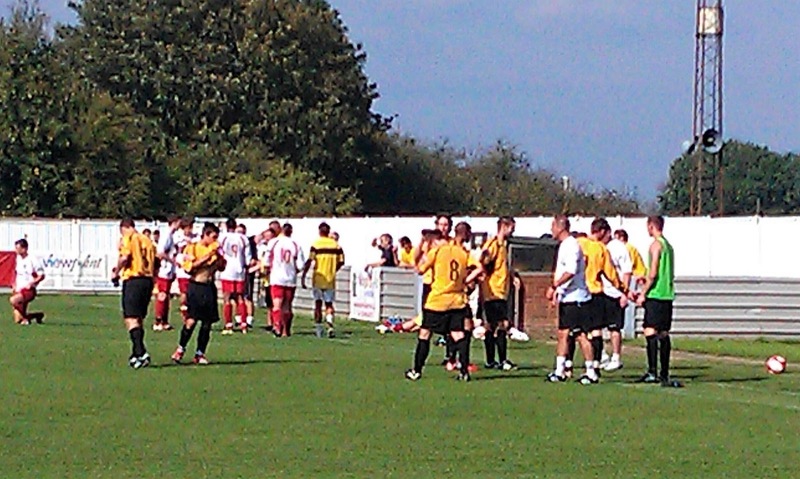 The replay the following Tuesday appeared to be more entertaining, with Southend Manor running out 4-2 victors. My second visit to Cheshunt came a few years after my first, for a pre-season friendly. It would be part of a double for me that day with a trip to Kings Langley v Hemel to follow after this game kicked off at 1 PM. Wycombe would field a number of trialists and most pf those would not sign on full-time. Of those Jamie Tank was a former Walsall and Wolves defender, last seen plying his trade for Grantham Town. 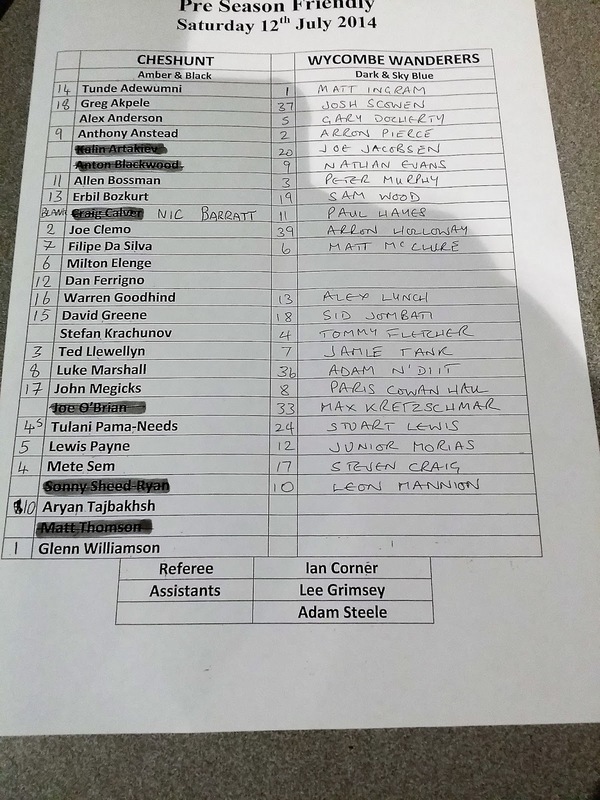 Tanzanian Adam N'diti was a former Chelsea midfielder, now playing for Guildford City. Finally, Leon Mannion had come from local football and is currently whereabouts unknown. As for the game, it was far more entertaining than my previous visit. 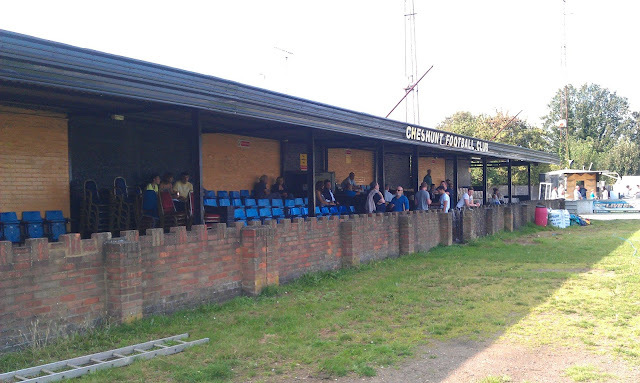 Of the players for Cheshunt, I recognized Anthony Anstead who had presented 'For The Love Of Cars' with Life On Mars star Phillip Glenister earlier in the year. He came closest early on, nearly catching out Matt Ingram with a shot. Wycombe took the lead on 20 minutes after a Nathan Evans cross was headed in by Matt McClure. Two minutes later, Matt McClure got his and Wycombe's second a couple of minutes later when he tapped in a Josh Scowen squared ball at the far post. Halftime brought a complete change of players for both sides and it was hosts Cheshunt that had the better of the second half. Tande Adewmni scored two goals in three minutes around the 70-minute mark. First, he had a simple tap in after Wycombe failed to clear the ball properly, then he chipped substitute keeper Alex Lynch. Wycombe got a late winner on 88 minutes as Nic Barratt deflected Paris Cowan-Hall's cross past his own keeper for an own goal. 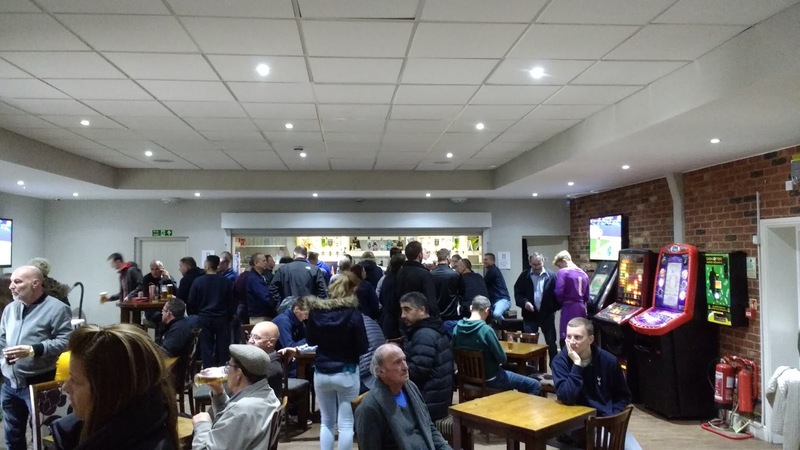 The club was formed in 2006, playing at first in local Sunday Leagues before progressing to Saturday football. 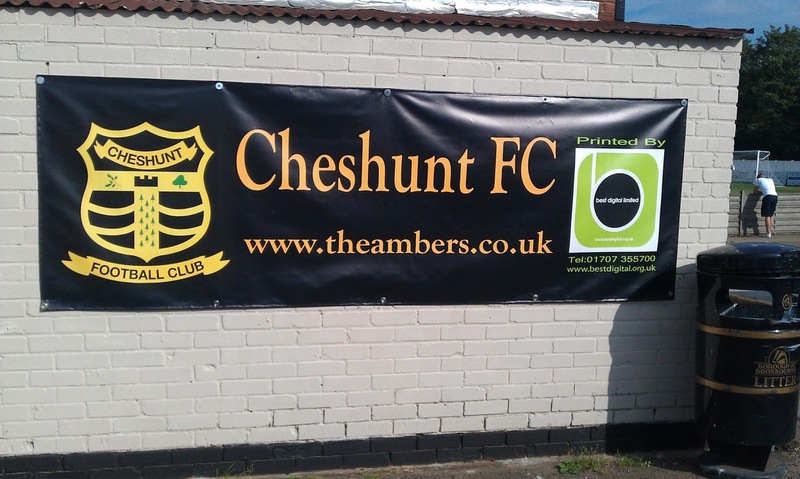 In 2013 they joined the Essex Senior League and have been largely successful, never finishing below 6th. IN the past two seasons they have finished 3rd, scoring over 100 goals on each occasion. At the time of the game, they currently sit in the same 3rd place and remain unbeaten at home, only dropping points in a bore draw with Stansted. FC Romania have only played in the FA Cup since 2014 and have already matched their best progress this season. Previously they reached the 2nd Qualifying Round in their debut season, beating Haverhill Rovers, Heybridge Swifts and AFC Sudbury before a narrow 3-2 defeat to Sutton United. 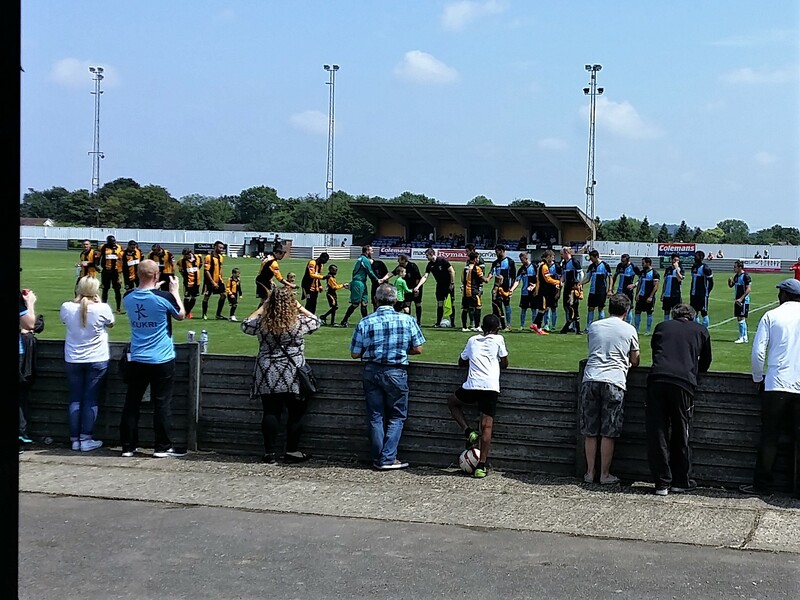 During the 2015/16 season, they enjoyed their best ever run in the FA Vase - beating Baldock Town, Hadley, Gorleston & Hertford Town before losing to Camberley Town. With the number of grounds I had yet to visit ever dwindling in the FA Cup, I was going to be hard-pressed to find a game, especially as I was unable to see a game due to Wycombe commitments on Saturday. So, it looked like a revisit if I wanted to continue my run of seeing a game in every round. FC Romania v Hayes & Yeading United represented a chance of a giant-killing. The hosts intrigued me. Formed in 2006 to better represent Romanian immigrants in London, my memories of Romania actually came 12 years earlier. With no England in the 1994 World Cup, I had to adopt someone to support and in the end I chose the coulourful Romania side. They must have impressed my 14-year-old self. Dan Petrescu, Gheorghe Popescu, Florin Raducioiu and Ilie Dumitrescu would go on to star for various teams in England whilst I was also impressed with Gheorghe Hagi, Florin Prunea and Vorel Moldovan also impressed. They beat favourites Argentina on the way to a quarter-final defeat to Sweden on penalties. It was to be my first day back at work in a fortnight on the day of the game. It had been a mixed two weeks off, a nice break from work but an expensive and unhealthy one and I was partially looking forward to earning again and working off the few pounds I'd put on. Wycombe also continued their rotten home form against Luton, losing 2-1 with both Luton goals coming in injury time. They've now failed to beat the Hatters at home in 13 games. I tried to get an early night's sleep the night before but it was a restless one before my alarm woke me up at 4 am on Sunday. Work wasn't bad, but there were the usual cockroaches that phoned in sick after going out on the lash on Saturday night. I'd done all my duties though, so by 11.30 I was leaving, despite them needing people to stay on. It was 11.40 by the time I got away after getting changed and after a reasonable journey, I was parked up at the ground by 12.30. Entry was an excellently priced £5, a bargain for such a decent game. I was pleased to meet fellow groundhoppers Dan and Ryan, the latter who I had not seen for ages. The FC Romania fans were creating a great atmosphere and a nice colourful display of flags. I stood with Ryan and his Dad for the game, along the side of the pitch. It was disappointing to hear no team news or see no team lists available, so it was guesswork as to who had scored. Hayes started the brightest and for a while, FC Romania looked like they were overwhelmed by the occasion. The visitors opened the scoring after 11 minutes thanks to Rohdell Gordon. Though I thought he was Hayes' best player on the afternoon, his shot wasn't especially powerful, yet it seemed to go right through the home defender on the line. FC Romania equalized on 29 minutes, it was sod's law that I was in the toilet the moment it hit the back of the net. From what I understand though, it was more poor defending, with the FC Romania winger rounding Hayes' keeper Jack Smith to make it 1-1. It was in the midst of a good spell for the home side, but the visitors were still dangerous on the break. On 37 minutes, ex QPR striker Rowan Vine forced a great save out of the home keeper but Spyros Mentis blasted over from close range. The visitors had enjoyed the better of the first half - just - and looked the favourites to score the next goal. FC Romania's half-time team talk seemed to reinvigorate them and three minutes into the new half, they were ahead. A home player spotted Hayes' keeper Jack Smith off of his line and tried a speculative 70-yard lob. Though Smith initially did well to get back, he palmed the ball into no man's land and stood looking at it for what seemed like ages. A home striker was quickest to react and he nipped in to tap home from a few yards out. Four minutes later they could have extended their lead when they hit the bar but the rebound had blasted over. The home players seemed a little too keen to go to ground at times, but it was a daft act that brought about the visitors with around 10 minutes to go. In an off the ball incident, the Romania number 20 lashed out with his elbow at Spyros Mentis and a penalty was awarded. Manny Duku stepped up and took it well and despite a mad goalmouth scramble at the end where the hosts came so close to scoring it remained 2-2. It had been a great game of football to watch and now the two sides now face a replay in Middlesex on Tuesday night. It was the right result on the balance of play but just six years ago, the two sides were oceans apart. While Hayes were enjoying a reasonable start in their final season in the Conference Premier, FC Romania were playing in the Middlesex Division 1 at step 8 of the non-league pyramid. The two sides have seen a rapid change in fortunes of course, with Hayes now just one level above their opponents. 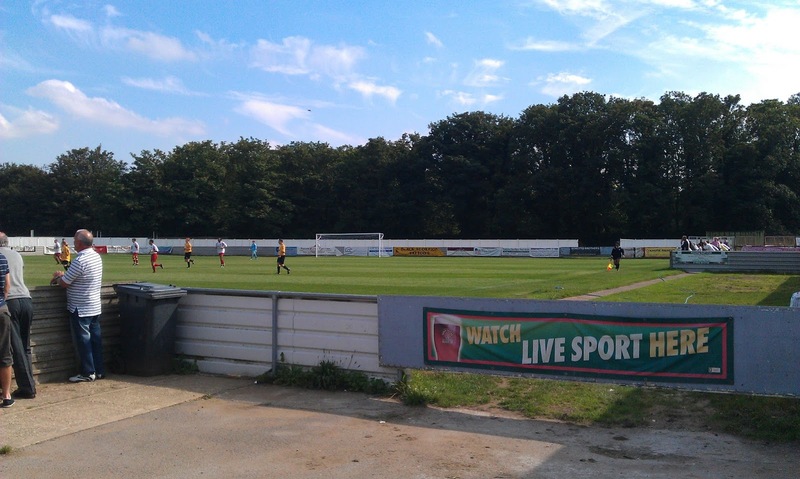 Despite playing in the Southern D1 East, they still charge a hefty £10 entry for league games. However, credit to them, they have reduced the prices for the replay to £6 and I may still well be tempted to go. I said my goodbyes to Ryan & Dan and made my way home. There was a bit of a queue getting onto the M25 and then I got stuck behind a very slow learner driver once I got off of the motorway, but even so, I was still home by 3.50, having enjoyed a good day with good mates. CHESHUNT STADIUM was a fairly old looking stadium on my first couple of visits. There was no cover behind the goals although along the sides there were a couple of seated stands with a capacity of 424. 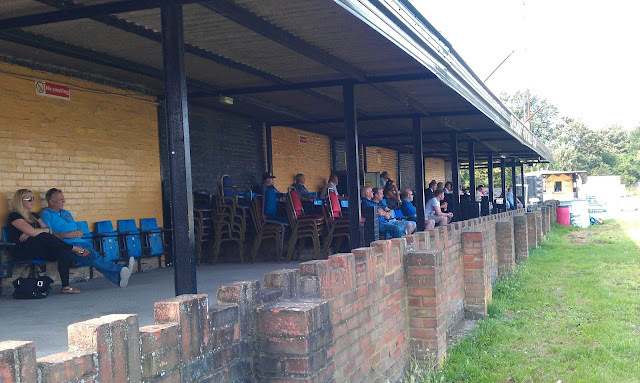 There is also covered standing for around 600 whilst the ground is mainly open with a capacity of 3,500 total. 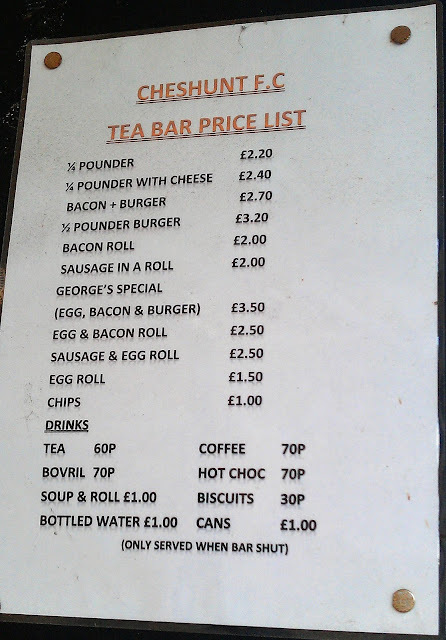 I recall the tea bar being decent and although there was a bar, I don't recall a club shop. Upon my revisit in 2017 for FC Romania, quite a lot had changed. 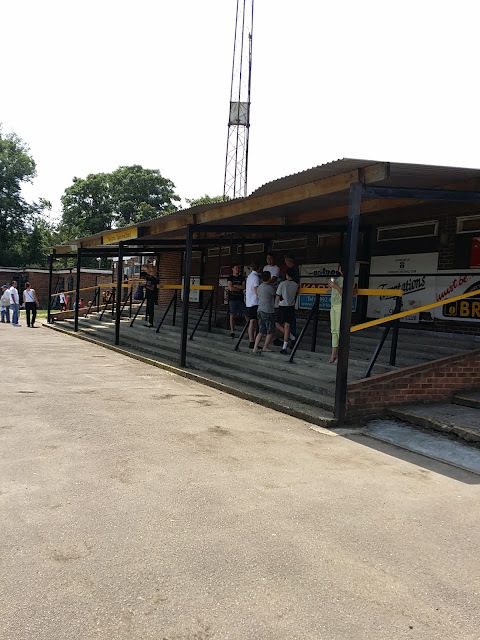 There were changes on 3 sides with two older stands on the near side being replaced by a singular metal stand with around 250 capacity. Furthermore, behind each goal are small metal stands with space for around 50 fans under each. The bar looked pretty modern, although I didn't have anything to drink. FC Romania also had a range of souvenirs, though these were quite pricey with pennants costing a tenner.